My little European styling, bargain hunting, on trend but not too trendy heart is beating a little faster today, y’all. Sorry about the caps. I’m excited, but to be honest, the store opening isn’t even the most exciting part for me. But I’ll get to that later. The Shops at La Cantera! If you’ve never been to an H&M, at this approx 27,000 sf location you can expect to find collections for ladies, men, young ladies and young men, with separate “store within store” sections for accessories, lingerie, sports apparel, maternity and its plus-size line, H&M+. I am especially excited for the children’s collection, which features unique, stylish clothing for kids of all ages, from newborn to fourteen years. It’s no secret that I am big on both natural living and recycling. And so is H&M! They are one of the largest users of organic cotton in the world. And the sustainable designs for Summer 2014 are just the start, as H&M is committed to using only organic or better cotton in all of its collections by 2020. In addition to responsible harvesting, H&M offers a garment recycling program. Through this initiative, H&M customers at The Shops at La Cantera can help save natural resources and contribute to a reduced environmental impact by donating old and unwanted pieces of clothing from any brand while in the store. Customers will receive a voucher for 15% off their entire purchase for each bag of donated clothing. 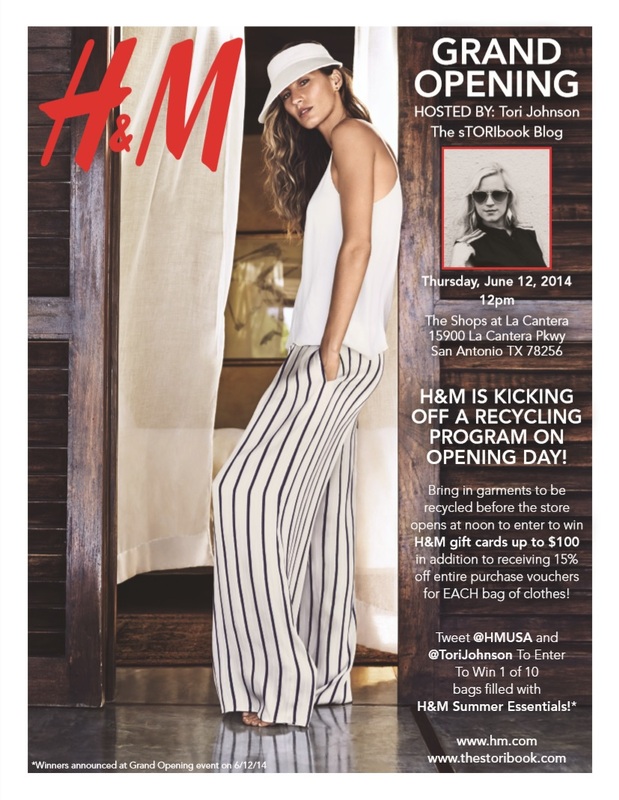 To kick off the recycling program on opening day, customers who bring garments to be recycled before the store opens at noon will also have the chance to win H&M gift cards valued between $50 and $100 in addition to receiving the 15% off voucher. In celebration of opening day, H&M at The Shops at La Cantera will offer the first 300 shoppers in line an H&M t-shirt and Access to Fashion Pass, valued from $10 to $300, hand other exciting opening offers for the whole family! The party is being hosted by SA’s own fashion icon (and wonderful friend), Tori from The sToribook! So clean your closet, tweet to win, and get in line for swag. I’ll see you in the dressing rooms! Be sure to tag me in some pics of your finds! The Shops at La Cantera is located at 15900 La Cantera Parkway, Suite 25190, San Antonio, TX, 78256. The store can be reached by phone at (855) 466-7467. Store hours will be Monday through Saturday 10:00 a.m. to 9:00 p.m., and Sunday 12:00 a.m. to 6:00 p.m.
Disclaimer: I received an outfit rom H&M for my services. All opinions expressed here are my own.